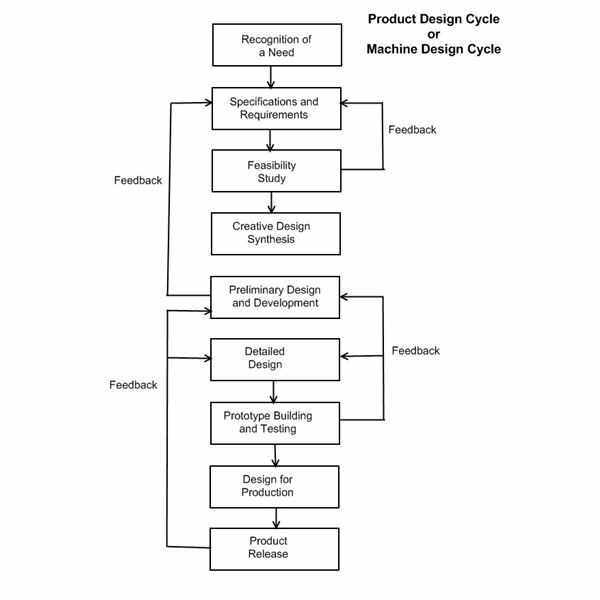 Stating the specifications and the requirements is the next important step of the system design cycle or machine design cycle (see fig. below). In this step all the requirements and the specifications of the need are studied in full details. Say for instance the new engine is to be designed. Here the all the important requirements and specifications like the power engine has to generate, the torque it has to produce, the speeds, the number of cylinders, type of fuel to be used, the method of ignition etc, all such requirements and specifications have to be considered. 1) In general terms: In many cases the specifications of the product to be designed are specified in a very vague manner. Say for instance if the customer wants the company to launch a new product they will just give a vague idea like low power and high mileage for the vehicle. Based on this idea the detailed specifications and the requirements can be worked out at the time of designing. 2) Specification written in great details: The professional people and companies give detailed specifications and requirements of their needs. Some example of the professional companies can be militaries, atomic energy commission, and other sophisticated engineering companies. For instance if the military company gives the order for manufacture of the trucks, they will give detailed specifications of their requirements like the capacity of the truck, the strength required, the size of the engine, the power desired, the load lifting capacity, the safety factors, etc. In these requirements all the design and performance requirements are clearly stated. The health, safety, or any other legal requirements will be part of the original specifications. In addition to these specifications the government, commercial and industrial standards are made an important parts of the specifications. One of the important points to note is that when the company produces specification, they keep in mind the production competence and the capacity of the company that has to design and manufacture the product.